A business proposal can often make or break your chances of securing a new client. So, how do you write a business proposal, and what’s the proper format? What’s the Best Business Proposal Format? Download your free business proposal template here. While the template will guide you through what you need to write, this article will be a great help as well! A business proposal can make or break your chances of securing a new client. Write a great one, and you’ll likely snag their business. Write a poor one, and you might lose out—even if you’re offering the best service out there. So, how do you write a business proposal, and what is the proper format? While it depends a lot on your industry, and whether or not you’re offering a product or service, writing a business proposal is pretty straightforward. A business proposal is generally a document you’d send to a prospective client, outlining the service you’re offering, and explaining why you’re the best person for the job. It’s a pitch by a business or individual to complete a specific job or project, to supply a service, or, in some instances, to be the vendor of a certain product. A business proposal can be either solicited or unsolicited. 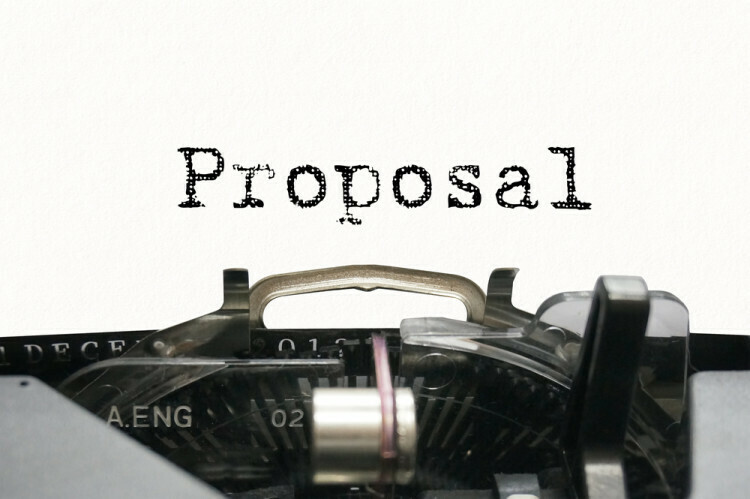 With a solicited proposal, the prospective client will put out a request for proposals; with an unsolicited proposal, you are approaching a client in hopes of attracting their business, even though they did not explicitly request a proposal. While both are commonplace, a solicited proposal is an easier sell, as your prospective client has already decided that they want to make a purchase or use a service, and they’re evaluating possible vendors or businesses. With a solicited proposal, your prospective client might have issued an RFP, or “request for proposal.” This is exactly what it sounds like—they want you to send over a business proposal, so they can take a look at it. There’s some confusion about what a business proposal actually entails, so before we get into the details of the business proposal format, let’s cover what a business proposal isn’t. A business proposal is not the same as a business plan. This is the most common misconception, but while there are areas of overlap (like your executive summary) the two are different. That being said, you can certainly pull information from your business plan while writing your business proposal—in fact, that’s a great way to start. But don’t confuse the two; they are distinct and separate. Why aren’t they the same? Well, for one, a business proposal is directly from an established business to a prospective client. You’re trying to sell your prospective client on your product or service, not on your business itself. You’re not after funding, as you are with a business plan, but rather after their business. A business proposal is also not an estimate; although you’ll likely touch on costs and outline these details in your business proposal, an estimate is much more informal and just a quick look at the costs, not the whole picture. The three Ps are the basic ideas that your business proposal should be addressing. As you’re writing your proposal, keep these elements in mind. If you’re stuck on how to start, maybe try brainstorming first; start with these three points, and you’ll have a rough, bare-bones version of your business proposal. Once you’ve done that, if you’re ready to go more in-depth, here is a step-by-step look at how to format your business proposal. Your business proposal should start with a title page, which should include your name, the name of your company, the name of the person to whom you’re submitting your proposal, and the date submitted. Depending on how long your business proposal is, a table of contents is a nice touch. Include it after your title page, and before you launch into any details. Introduce your proposal with a great executive summary, one that really sells your business and the products or services you provide. You can draw from your business plan’s executive summary here, too. For details on how to write your executive summary, see our article How to Write an Executive Summary. Following your executive summary, go on to discuss the problem that the client is currently facing. Think of “problem” or “issue” loosely; after all, their main problem may just be finding the right person to complete their project. However, this is the place where you can show your new client that you understand their needs, and fully grasp the issue they are trying to solve. Take this opportunity to restate the issue they are facing in your own words, so that they know you understand what they are looking for. This section shows how you plan to tackle your potential client’s problem, and the steps you’ll take to carry out your plan. This is where you’ll get into the nitty-gritty of how you actually plan to fulfill your client’s needs. While earlier sections might have been a bit surface-level, this section of the business proposal is where you’ll go into detail about what steps you’ll take to solve their problem. Be careful of going into too much detail, though—keep the jargon to a minimum. Your client should be able to follow along and get a clear sense of your plan, but you don’t want to drown them in minutiae. Go ahead, brag a little—this is the section of your business proposal where you get to convince your potential client why you are the most qualified person to take on the job. You can mention any relevant education, industry-specific training, or certifications you have, your past successful projects of a similar nature, years of experience, and so on. Be clear with your potential client: How long will your proposed project take? Making sure you and your prospective client are on the same page from the outset will help make sure that the relationship stays positive for both of you, and that you don’t set your client up with unrealistic expectations. While you might be tempted to underestimate how long it will take you to complete the project, don’t. Don’t promise what you can’t deliver! If you’re offering a product, this section might not be applicable to you, so feel free to omit it. The business proposal format is flexible, so tailor it to suit your business and industry. Here is where you get down to brass tacks and state the cost, and payment schedule if necessary. How you structure this section will largely depend on the particular project or service you are offering. A section entitled “Fee Summary” may be sufficient if a one-time payment is required; otherwise, a “Fee Schedule” list might be more appropriate. Always refer back to the client’s RFP whenever possible, to make sure you’re supplying them with all the information they need to help make their decision. If there are any legal issues to attend to, such as permits or licensing, include this information here. Feel free to add a section entirely devoted to handling the legal side of the project if need be. This is your final sell—don’t be afraid to detail for your prospective client all they have to gain by choosing you to complete the project. Impress upon your clients why you are the best choice, and all the ways in which their business will benefit from choosing you and your business as their solution. How long does it have to be? When it comes to the format of a business proposal, this is the million dollar question without an answer. Remember in school, when you’d ask your teacher how long an essay question should be, and they’d reply, “as long as it takes to answer the question”? The same applies to your business proposal. It ultimately depends on your industry, the scope of the project, and the client’s specifications in terms of detail and elements included. However, if you follow the business proposal format above as a guide, you’ll be well on your way to creating a winning business proposal—and securing new clients.